54613 is rated 3.4 out of 5 by 8. Rated 2 out of 5 by daisy from Leaking problems I have two of these delta 54613's, and not only are the adjustment for the different sprayers hard to turn, but they also drip on 2 of the 3 sprays options. Overall, too expensive, and the handheld is to heavy, and somewhat not very usuable. Rated 3 out of 5 by Keyav8r from Delta 54613 hand shower This shower works well, puts out a good stream of water and has enough functions for our needs. The only problem is that it has a tendency to fall out of the holder if bumped, especially if it is tilted too far past vertical. Rated 4 out of 5 by harydyn from Delta Bronze Handheld I got this to replace a dinky, fixed shower nozzle in a guest bath. I have not had any issues with weight, although I have noticed the "cracking" noise mentioned by others when changing positions. Still, no problems and a vast improvement over what it replaced. Rated 1 out of 5 by grende from somethings not right Functionally the product works as expected. The angle adjustment is extremely loud, to the point where it sounds like it cracking. I do not expect the angling portion to last very long. For the price and quality of normally excellent Delta products, this is not one of them. Rated 4 out of 5 by gamecock723 from Nice, but could be better This hand shower looks good and functions well, but there are a few things about it that I don't care for. First, you can only change the angle of the holder to three different levels, which isn't so bad except that the plastic piece makes an awful cracking noise whenever you change it. Furthermore, the actual shower is a little too heavy for the holder and it ofter will drop down to the lowest angle on its own. Not the worst thing in the world, but a little annoying and unexpected for Delta. Second, it is somewhat difficult to change the sprayer settings (massage, full spray, etc) since there is no handle or other piece to grab and rotate. You have to be able to grip the outer band well enough to rotate it, which can be hard if you have small hands. This isn't really a bother for me since I don't ever change it from full spray, but it could be annoying to others. Overall, I like it but wish there were a few things different about it. But it matches all my other delta fixtures perfectly and really adds to the bathroom. It also has a nice long hose, which is very handy. Rated 3 out of 5 by beentheredoneit from need of redesign I purchased two of these not quite a year ago,one has broken on the internal plastic pivot knuckle and I am having a hard time getting the part needed to get it back functioning. The other main concern is that the actual hand held part is so heavey it will fall out of the tiny cradle and smash a toe or scare the crud out of you as it hits the shower floor if you slightly bump it.The unit itself is very well made but could have easily been made better suited for everyday use with just a little trial and error on deltas part. 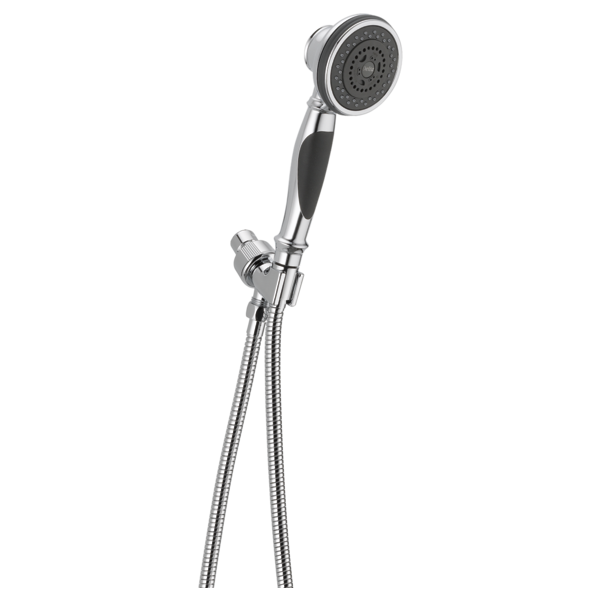 We have just purchased the Delta54613 hand held shower head. This has three function spray. Which functions does this model have? I'm looking for the replacement part of the piece that the shower head goes into. I uploaded a pic. Its a chrome finish. How do you recommend cleaing water spots off of Delta 54613 and Delta back plates that have hard water spots. WHICH ROUGH VALVE SERIES IS NEEDED FOR THIS SET? Can the mounting arm be purchased for a 543613 shower head? We had a custom tile shower stall installed. The hand shower head comes out of the wall about 70&quot; high. Unfortunately the handle fits into the holding bracket at the bottom of the handle raising the spray head about 8&quot; higher then where it comes out of the wass. This caused the spray to hit way to the back of the shower which means if we stand at the back of the shower the spray hits us at neck level. Is there any workaround to bring the spray area down? I have adjusted it as low as it will go. I appreciate any help you might be able to supply us with.